Beginning the next 10 years! On June 19th, Tazza D’Oro had a blast. We celebrated our 10 year anniversary and man o man what a party. (btw, it has taken me all weekend to recover!) We are pretty sure by the end of the night we had well over 200 people. I was overwhelmed and grateful for how many of you showed and for your generous well-wishes. Thank you! We do appreciate your support and how much coffee you drink everyday! Diana Nelson-Jones of the Pittsburgh Post Gazette documented some of the evening in her City WalkAbout – check it out. Thanks to all my fellow coffee peeps that showed (Aldo’s, 21st Street, Voluto, Espresso a Mano, Union Project, La Prima, Turner Dairy) and all our locals for the great food, ice cream and beer (Abay, Point Brugge, Buffalo Blues, Oh Yeah, East End Brewery). For me, Friday was a celebration beginning the next 10 years. Since September, we have been working pretty hard thinking and planning for the future. One of the major changes was the transition to our new coffee roaster – Verve, located in Santa Cruz, CA. 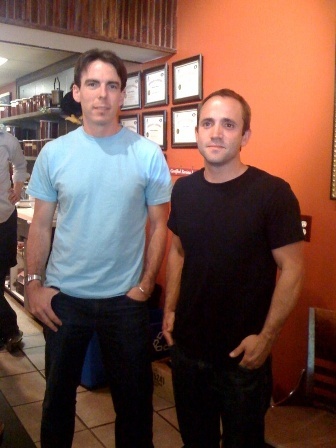 Colby and Ryan, owners of Verve made the trip to Pittsburgh to help us usher in the new decade and to share their philosophies about their company, Verve, purchasing and roasting coffee, single origins, and the coffee business. 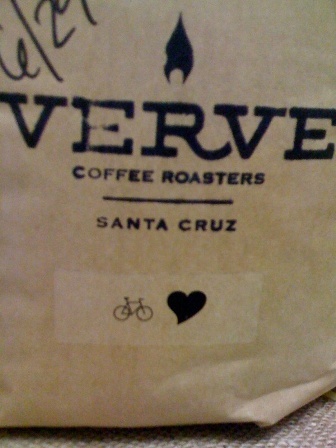 We also introduced our new espresso blend – we’re calling it “Bicycle Love Espresso Blend” – dude, home run!